A great lunch, from leftovers! In a little bit of oil, fry the onion on medium heat until softened and lightly golden. Add the spinach, and fry until wilted. 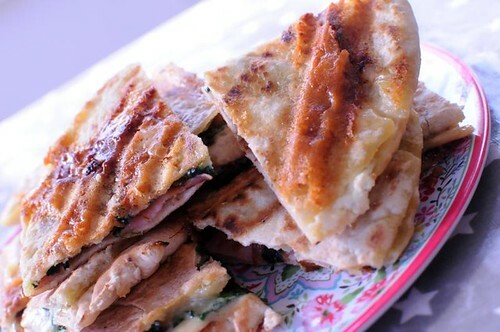 Fill the pita breads with cream cheese, ham, the onion mixture and grated sharp cheese. Grill, using a panini press, or even a waffle iron, until warm and golden. I love quesadillas. I don't know why they are so much more satisfying than cheese on toast, but they are! This sounds absolutely fantastic; what a clever combination of two dishes! I've got to try this.